Learn why you should take the E Patrol Challenge at your school! TEACHERS GET YOUR KIDS INVOLVED! Help them be responsible to the community, while teaching them valuable lessons! Start a RECYCLING Patrol with students at your school. Teach kids to be Planetpals! Start an E patrol at your school today! Form a Planetpals E Patrol in each classroom at your school or a Planetpals E Patrol Committee for the entire school. Have each student vote on E Patrol leaders. This could include scrap from thir homework or class work! Expand beyond the Paper waste listed to include batteries, inklcartridges, and so on. Start a recycle program that earns school equipment such as an inkjet/laser/cell phone recycle. It's a great fundraiser, too! Check your school online, check other schools online: Make a website with all your Earth science projects including your E Patrol Progress! 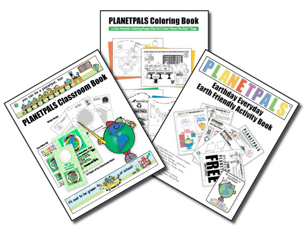 Planetpals Books include Planetpals Classroom Book, Coloring Book, and Earthday Everyday Book. Planetpals E Patrol is included in the Classroom Book as well as other Epatrol Ideas and activities. It is available as a download or print version for phoocopying. Link to your town pages. Print this page for easy reference! Check out your local recycle center, it might inspire you to do even more! At your local recycle center you will find you can recycle and trade many things from computer equipment and televisions, books, appliances, hazardous materials, paint and more. More squeaky clean Ideas for you at School! Here are a few additional ways you can help the planet during the school year..remember every litter bit helps! Keep a "craft box" of discards you think might be handy for class projects during the year...mark it "my craft box" so no-one will mistake it for trash! Keep things like empty yogurt containers, elastics, string etc...that might interesting and useful for your art. 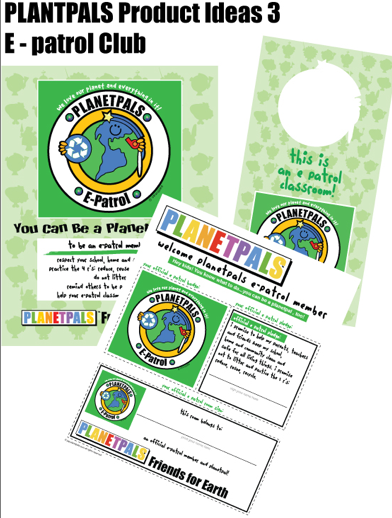 Ask your teacher to put up Planetpals recycle kitsposters to remind everyone at school about recycling. Make recycling an important part of your life at home and at school!